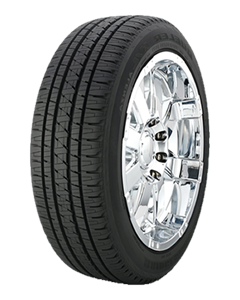 The Dueler H/L Alenza with UNI-T and/or UNI-T AQII technology is Bridgestone''s Crossover/SUV Touring All-Season light truck tire developed for the drivers of premium crossover and sport utility vehicles, as well as light duty pickup trucks. The Dueler H/L Alenza is designed to provide elegance with an edge, as well as year-round traction, even in light snow. While all Dueler H/L Alenza sizes feature Bridgestone''s UNI-T technology to take tire behavior to a higher level by increasing comfort and control, in order to further enhance wet traction over the life of the tire select sizes also have Bridgestone''s UNI-T AQII technology which features dual layer tread compounds to resist the normal tread rubber hardening that results from the heat encountered during thousands of miles of use. As the tire wears, the special underlying high-grip rubber is exposed, helping offset the effects of heat and wear on wet traction. The result is that UNI-T AQ II technology helps handle wet road conditions even as the tire wears over the years. The symmetric tread pattern of the Dueler H/L Alenza has been ride and noise tuned to enhance comfort. Large shoulder blocks and a continuous center rib boost responsiveness and highway stability, while wide circumferential grooves, lateral notches and sipes help increase stormy weather traction. The tire''s internal structure includes twin steel belts (reinforced with spirally wound nylon for H-, V- and W-speed rated sizes) to provide support under the tread area, while polyester cords stabilize the sidewalls and enhance ride quality.